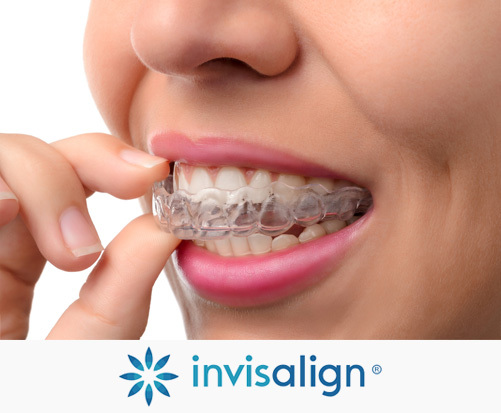 Invisalign is a contemporary orthodontic treatment that straightens teeth using a series of clear aligners. If your teeth are crooked or crowded but you don’t like the idea of wearing fixed braces, Invisalign is an ideal solution. Invisalign uses a sequence of clear, custom-made aligners that are changed every fortnight as the teeth gradually move. The aligners are designed to gently guide the teeth into the correct position without wires or brackets. One of Invisalign’s greatest advantages is that the aligners are removable, allowing you to eat and brush your teeth without inconvenience. They are also virtually invisible, so there’s none of the stigma attached to the bulky, metal braces of days gone by. The length of treatment depends on each individual case, but on average Invisalign takes 9-18 months to straighten teeth. As well as being a comfortable and discreet alternative to traditional braces, there are a number of advantages to straightening your teeth with Invisalign. Treatment is planned in advance using 3-D Clincheck technology, which means we can accurately predict a completion date for your treatment. Removable aligners mean that you can brush and floss your teeth with ease, so periodontal health is improved. The aligners are tailored to match the shape and size of your teeth to reduce irritation. If you’re interested in Invisalign treatment at Wayside Dental Practice, contact us today to arrange a consultation. We also have offer alternative orthodontic solutions such as Six Month Smiles.